Participating in Offers under the Discover section can be a great way to earn a lot of points called SB, but the offers sometimes require signing up and/or credit card information. However, there are also free offers, like installing an app on Facebook or watching a short video. The Discover page can be divided into two sections on left menu, Swagbucks Offers and Sponsored offers. The Sponsored offers are through several different companies and are generally different than the Swagbucks Offers (and each company has a lot of different offers. You will want to check each company out). The amount of Swagbucks and the time it takes to credit your account varies from offer to offer. Some give SB instantly or others can take several business days to credit your account (or longer). 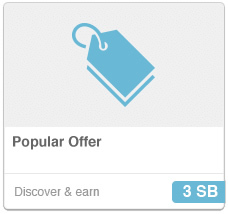 Remember though, you are not required to do these offers like some sites, it is just another way to get a some extra SB! 1) Make sure you have cookies enabled. This helps both Swagbucks and the other company to verify the completed offer. 2)If you have a ad-blocking software installed, it can sometimes cause problems with cookies. You might want to turn it off, pause it, or even better use the Swagbucks Whitelist Filter. 3) Make sure you complete every step that the offer requires. You won’t get credit if you don’t complete it. 4) Use real information. This also helps to track what offers you have completed. If you have any problems contact the customer support for the company you did the offer through (like TrialPay) and then if you still have problems, contact Swagbucks customer support.